No doubt about it, these days people have incredibly busy schedules. With all we have going on I sometimes wonder how we manage to have any quality time for ourselves. 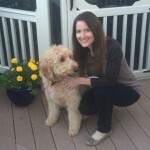 So, when it comes to your dog, how much time do you really have to spend? If it’s minimal, chances are you may have a bored and under-stimulated dog. These are the two major components contributing to the question of why a dog may be so hyper. Are You A Hyper Person? Did you know that dogs are masters of mirroring our energy? If you act excited, your dog will act excited too. Try it, and you’ll see exactly what I mean. Next time your dog is being calm, use excitable energy toward your dog (excited voice/body language) and you’ll see how your dog mimics the same. When you tone it down a bit, your dog will too. Now, that’s not to say this is the cure to making any hyper dog be calm, but it sure can go a long way in toning things down a bit. If you’re naturally high energy, this will take some practice, but remembering to be calm around your dog will pay off. For example, let’s imagine a dog in a hyper state and barking excitedly at every noise, that doesn’t even seem to exist, and causing their owner to feel a bit on edge. The agitated dog owner then proceeds to scream and yell at the dog to stop. But, will it help? Not at all. The dog doesn’t understand the human words, but he certainly can sense the excited state that his owner is in. “Fantastic!”, the dog thinks, “My owner has joined in!”. The result is that the dog decides to mimic the human’s excitability, while continuing to bark and be hyper. Not exactly the desired result! So, you can see where remaining calm can help in this situation, and any similar situations. It is easy to incidentally reinforce hyper behavior by responding to it. For example, you’re rushing around the house trying to get things done, meanwhile your overly hyper dog is following you everywhere, nudging you with his nose, and jumping up when possible. Annoying, right? What you should NOT do is give him attention as this will teach him that his tactics work! All dogs need exercise to maintain good physical health. But, it’s also good for the brain! Exercise will help keep your dog sharp, prevent boredom, and release all that pent up energy that can make your dog unpleasant to be around. If you’re a person who has little time, or hates exercise, this may be the last thing you want to hear, but a well-exercised dog means a tired dog, and therefore, one that will lack the energy to be hyper. Taking your dog for a walk, letting him swim, or going to a dog park are all fantastic ways to exercise your dog, but they’re not the only ways. Keep reading…I’m getting to more ideas. Some dog breeds simply have more energy than others and require exercise and stimulation over-and-above what other breeds require. 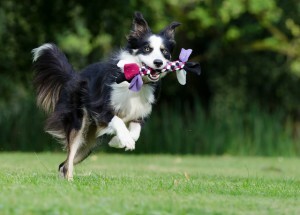 These dog breeds are perfect for those who lead a very active lifestyle. But, if you’re not as active as your dog would like you to be, you can still find ways to compensate and make your dog happy. A walk is usually the first thing that comes to mind when one thinks of exercising their dog, but for some dogs you could walk all day only to find it’s still not enough to tire them out. You come home exhausted, but your dog is still rearing to go. In this case, my absolute favorite solution is to use a bicycle. But, don’t try hanging onto, or hooking up, your dog’s regular leash to your bike, that could be asking for disaster. There are plenty of specialized bike leashes being sold on the market these days so you should be able to find one fairly quickly, and I know first-hand that they work great! Think about it, being on wheels enables you to get your bike going at a speed much faster than your dog can run. So, how quickly do you think you can wear out your dog? Very quick! Just be careful as you don’t want to over-work your dog and hurt him. Some dogs are great at fast sprints, but not so great at long distance running, so you may need to work up to it. But, when you consider that you may be able to wear your dog out in 10 minutes biking vs 30 minutes walking, you may find that a bike leash can be your best friend. If you’re a bit leery about your hyper dog pulling you over on the bike, read my article, Riding a Bike with a Dog. I had huge concerns about biking with my dog, but it has turned out to be fabulous. Hide treats around the house and have your dog find them. Start out with easy hiding places making them harder as your dog gets good at the game. Teach your dog new tricks, and practice old ones. Give your dog a Kong toy. Make sure it is stuffed with something your dog loves so he doesn’t lose interest. I do a mix of broken up dog bones mixed in peanut butter. I’ve timed my dog, and he will spend 20 minutes licking out every last bit. You can also prepare Kongs in advance and keep them in the freezer so that they are ready to go at a moment’s notice. 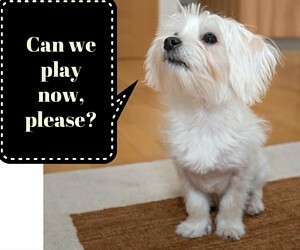 Let your dog play an interactive game. My dog’s favorite interactive toy contains multiple compartments that he needs to slide with his nose, or paws, in order to reveal the treats. The mere sight of this game gets him very excited. 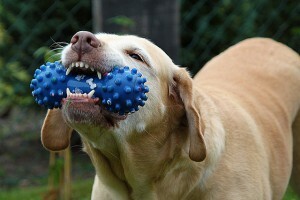 You can find various types of interactive dog toys at most pet stores. Create a make-shift agility course in the house, or yard. You don’t have to buy anything expensive here, just find things around the house that will work. Two kitchen chairs facing each other with a blanket or cushion thrown over the seats becomes something for your dog to climb under. A hula hoop becomes something to jump through; a broomstick becomes something to jump over. Laundry baskets set up in a row can be something to weave around. Children’s play tunnels can work great for crawling through. Give your dog a treat as he learns to complete each portion of the obstacle course. So, it’s the end of a long, busy day and you’re simply exhausted. Apart from pressing the buttons on the TV remote, and possibly holding your eyelids open, you just cannot muster the energy required to appease a hyper dog who feels his moment has arrived now that you are in his presence. But, alas, Fido isn’t out of luck, there are things you can do that require little energy on your part, but will make a world of difference to your dog. I know plenty of kids that would jump at the chance to make some extra money, especially when it involves walking a cute pooch. Provided your dog walks fairly well on a leash this could be a great opportunity to get your dog exercised and out of the house for awhile. Blow bubbles for your dog to chase and pop. Yes, believe it or not, you can find these on the market made just for dogs, in flavors like bacon, and peanut butter. Drop your dog off at a dog daycare while you are at work for the day. Chances are when you pick him up in the evening he will be exhausted. Teach your dog to run on a treadmill. How great is that? You get to sit back and supervise while your dog does all the work, it’s brilliant! If your dog has never done this before be sure to start on a very slow speed. You should be positioned in front of your dog using a few treats to encourage your dog to walk forward. Do NOT leave your dog unattended, and NEVER force your dog if he appears scared or resistant. I suggest watching a how-to video prior to attempting this, you can find many on YouTube. Providing your dog with plenty of exercise and mental stimulation will put you on the right path to calming your hyper dog. In addition, patience and a calm demeanor are vital to your success. And be sure to make time for lots of petting and snuggles! Hi Carol, My wife and I have a Shitzu and a Shitzhu/Pug mix. We have them crate trained so that they love to go into their kennel to get a treat. I walk them every day and toward the end of the walk our trouble maker “Penny” is as you say to tired to bark at everything. She normally barks at everything and ignoring that behavior doesn’t work. A strong command makes her back off and restain. You have lucky dogs to be walked every day, dogs really need that! I’m glad you enjoyed the read. Lady, my senior dog, is the least hyper dog you can find in the neighborhood and I strongly believe that that has to do with the way I interact with her since young. I have always use a low tone with her. I would only use a commanding voice when she misbehaved, like chasing the cats or growl at people and she gets that. Hyper dogs can be very frustrating to manage – they are very disoriented and can create a lot of chaos when the humans don’t know how to intervene. I am just glad that Lady isn’t like that. You must be doing things right…sounds like Lady is a good pup! Thanks for your comment. Thank you for the great information. We are getting a puppy and I have been teaching my teenagers about calm demeanor for the new pup. I am so glad this can work, and that it isn’t a foregone conclusion that a dog is born hyper. Its all in the energy and manner they are treated. Thanks again!